Description: Billy is orphaned at the age of four when a steer gores his father. A year later, Billy leaves his home ranch--the only life he has known--and strikes out across the land with Bopy, an old French-Canadian trapper. Bopy doesn't speak English very well, but they develop a strong friendship as they gallop across plains, over mountains, and through forested landscapes. While Bopy is busy prospecting and trapping, Billy spends his time drawing, reading, roping with cowboys, and playing with his pet wolves, Gros and Otay. Through his adventures, Billy discovers what he values most and learns that he can weather anything life throws at him, including a nosy grizzly bear and the harsh winter of the Canadian north-country. 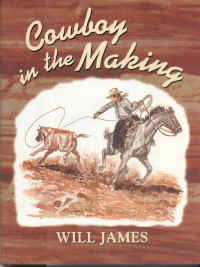 First published in 1937, Cowboy in the Making is a timeless coming-of-age story that shows how life experiences develop character. Will James' writing and his 25 pen-and-ink drawings capture a boy's view of the West at the turn of the twentieth century.